Is tape in your future? Provisioning storage is still mostly a manual job, but solid planning, including the right interested parties and some improved tools, can help ease the chore. Follow these provisioning best practices to gain greater performance and higher disk utilization. With some legislative requirements mandating data be kept for as long as 70 years, your organization needs an archiving plan that defines what data needs to be kept and why. But don't overlook how you'll restore old data when it needs to be accessed. Hyperion Solutions Corp. decided it could no longer cope with having two separate e-mail apps. 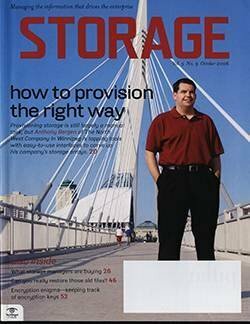 Storage considerations were among the many hurdles the firm had to overcome. Here's how they did it. In many companies, data that should be safeguarded against loss or theft isn't getting encrypted. The main reason why so many storage managers are shying away from encryption is that they don't understand how it functions within the storage infrastructure. Outsourcing your e-mail archiving is a good alternative if you want to avoid the hassle of implementing archiving yourself. But right now, service providers are falling short and need to expand their product portfolios to meet user demands.